In Santa Fe, New Mexico, on a mile-long stretch of Canyon Road, can be found the greatest concentration of art galleries in the U.S. Among these, at Canyon and Garcia Street, stands the Carole LaRoche Gallery. Ms. LaRoche has been proprietor and artist in residence there since 1982. LaRoche’s work at first glance appears deceptively simple – basic, figurative depictions rendered in pastels or acrylic on paper or canvas, prints in monotype or giclée. The backgrounds are characteristically spare and schematic or completely monochromatic and solid. The central or dominant forms or figures are typically bold and forthright. Standing out sharply against the expanse of more muted background hues, they often appear solitary and self-contained, even monumental. LaRoche favors animals, particularly wolves which she regards as guardians and protectors, though she also creates images of other creatures, both wild and domestic (burros, bears, buffalo, birds, horses, deer, cats, and the occasional elephant, lion, and zebra). She does shamen-like human images as well. 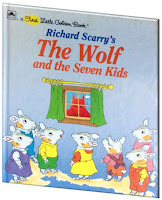 But her main passion, it seems to me, is wolves – wolves that come singly, a few at a time, or in packs. Red wolves, black wolves, golden, blue, or magenta wolves. Wolves cradling birds (Edward Hicks’ Peaceable Kingdom comes to mind). That’s certainly true as far as it goes, but to me there’s a good deal more going on in this work, especially when it comes to the wolves. LaRoche’s wilderness canines are looming, portentous creatures – almost mythical or archetypal. Indeed, when confronted with the likes of them, it’s the observer who’s apt to look still and vulnerable. Gazing in fascination, one can but trust that these resplendent beings are protectors and guardians as LaRoche prefers to think of them – and not, say, covetous of your soul! A few years ago, during one of my visits to the LaRoche gallery, I purchased a limited edition wolf print, Red Wolf and Flowers (giclée on paper). It came in a sturdy black wood frame faced with glass – intended primarily to shield the art, of course, but perhaps the new owner as well. The print has hung over my desk ever since. Thus far, Red Wolf has yet to escape that picture frame, at least from what I can tell. Still, though I fancy him securely confined, staring at me through a bed of brightly colored flowers that conceals his face almost up to his eyes, he in turn keeps me constrained – transfixed, almost paralyzed – with that piercing gaze of his. For a truly overpowering prospect he be! The great mass of his orange-red head, thick neck, and truncated portions of shoulder and chest contrasts starkly with a dark grey background. His ears point nearly straight up like horns, signaling a state of high alertness and perceptivity. 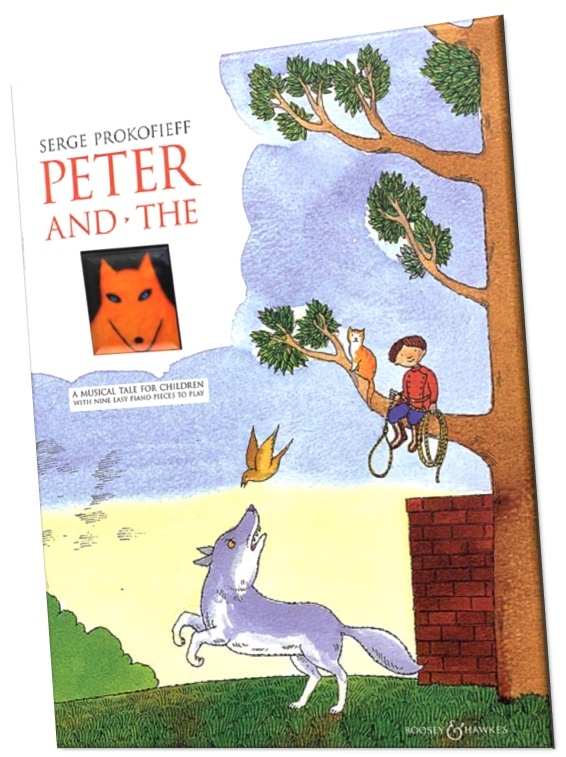 His muzzle, rendered with no more than a single black line, thicker at the left angle of the jaw to suggest shadow or space, is broad, flat, and puissant; a roughly triangular smudge partially concealed by the flowers comprises his nose. You feel a frisson of disquiet and foreboding about the piece. Is Red Wolf stalking from cover, or is he merely peering through the flowerbed? Is his hard stare meant to convey some sort of remonstrance, or is he simply indifferent, looking straight through you? Ironically perhaps, there’s also a touch of edgy comedy here. 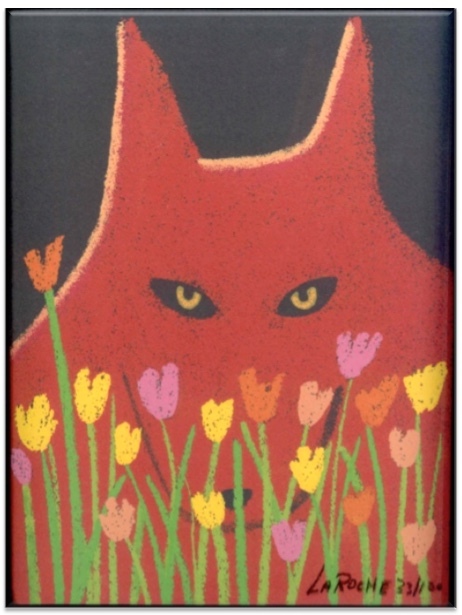 It’s as though crafty Mr. Lobo were contriving – with obvious difficulty and little success – to hide his imposing presence behind but a scant nosegay, to conceal himself with a posy of wild flowers instead of the usual sheep’s clothing. Yet droll as this seems, you're left laughing nervously. 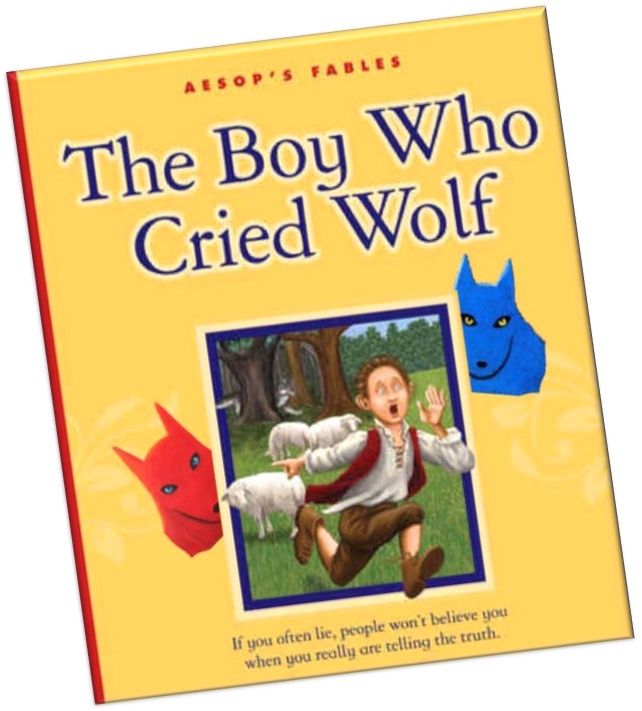 For if the wolf's intentions are malign, he doesn't seem to care in the least if you know it! A taste for gallows humor comes in handy here. But without a doubt it’s the eyes that have it. 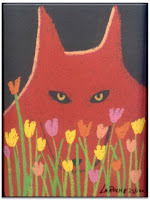 The most arresting aspect of the work by far is Red Wolf’s great yellow eyes and a gaze of such intensity you wonder if he’s some sort of demiurge. Eye contact is a powerful force that, sustained like this, could variously signify aggression, affection, or deception. It’s physically and mentally challenging, yet hard to escape. A fixed stare of this sort obliges you to respond in some manner – perhaps by adjusting your tie, looking at your watch, or even walking out the door – but you have to allay the unease somehow. It can be downright discombobulating. In other news, there’ve been rumors recently of unusual grassroots unrest on Canyon Road, though it's not clear just how it all started. 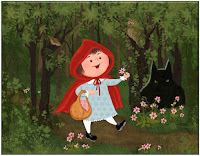 Ms. LaRoche’s wolves, it seems, have been slipping the confines of her studio and venturing off on their own, turning up surreptitiously as interlopers in musical compositions, legends, folk tales, and children’s stories – in some cases, making quite a muddle of things. 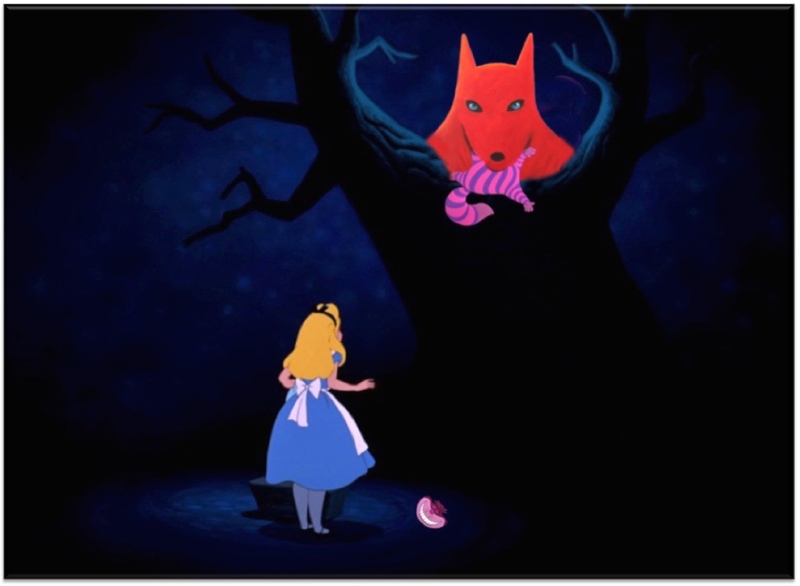 Thus, Deacon Carroll’s Cheshire Cat seems to have disappeared once and for all, courtesy of you-know-who. And guess who’s been stalking Little Red Riding Hood. 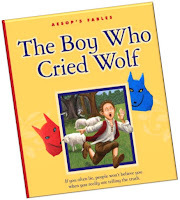 Now it appears the Boy Who Cried Wolf may have had good reason to all along. 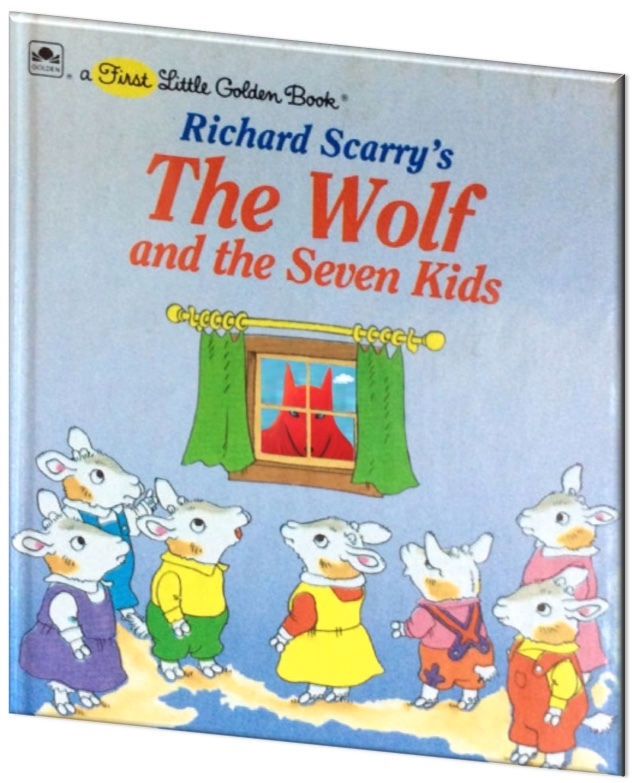 The Wolf and the Seven Kids has somehow acquired a replacement antagonist – never mind about Richard Scarry’s. Likewise for Maestro Prokofiev’s Peter and the Wolf. 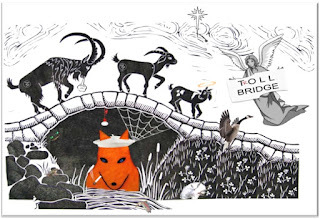 As for the Three Billy Goats Gruff, it’s no longer a troll that awaits them under the bridge. And someone’s been trying out new insufflation techniques on the houses of the Three Little Pigs. Clearly, things in Santa Fe have gotten out of control, and I suspect Carole LaRoche could use a hand. So thither I suggest you hie, there to become like me a guardian of the guardians: adopt a wolf – better still, a pack of them – frame and all, at the Carole LaRoche Gallery. Her staff will be happy to assist you. Or you can establish custody online or by mail. Got to run now. I’m all out of ink – and somebody’s at the door. NB: I have no commercial or financial relationship with the Corale LaRoche Gallery.